Found this on craigslist, ugly but the guy took my lowball offer so I went for it. This thing is UGLY! The lines are waaaaay off the real thing. I hate the bolt on rear quarter windows, plus the guy painted the side and rear window black so people couldnt see the lil v6. I dunno how he drove it, U cant see anything from the blind spot or the back window. This things been neglected in every way. 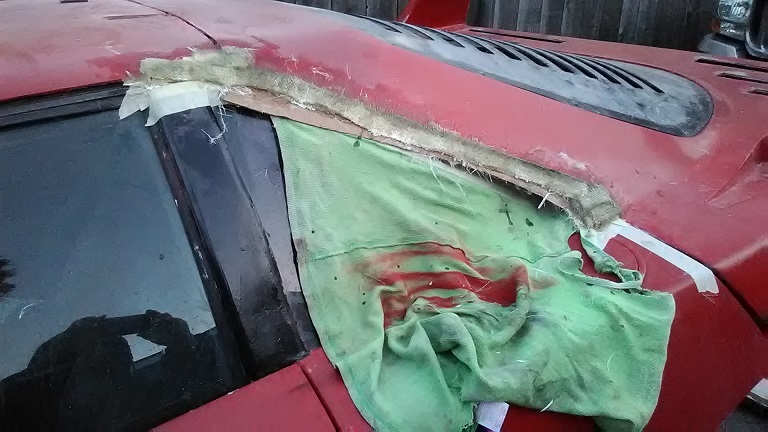 Fiberglass cracks everywhere, rear wing was about to fall off, some goober tried to bondo it back on lol). Anywho, Ima clean this up and probably resell it. That nose is so far off from the real thing it kills the whole car for me, Cant even see the front wheels, theyre 3" inside the wheelwell! The rear wheels are 11.5" wide and he has a bald 245/50/16 on there and the sides of the tire go outward to fit the wheels. Wow! Whatta waste of effort, building that! Making the molds and all! Good luck with your turd! From: South Weber, UT. U.S.A.
You've obviously got a much larger bar of turd polish than I do. Good luck and I'll keep checking back to see your progress! Was that listed in the sf bay area craigslist? I think I remember seeing it there for a while. Good luck on the fix up! You must be an old fart. Good luck. 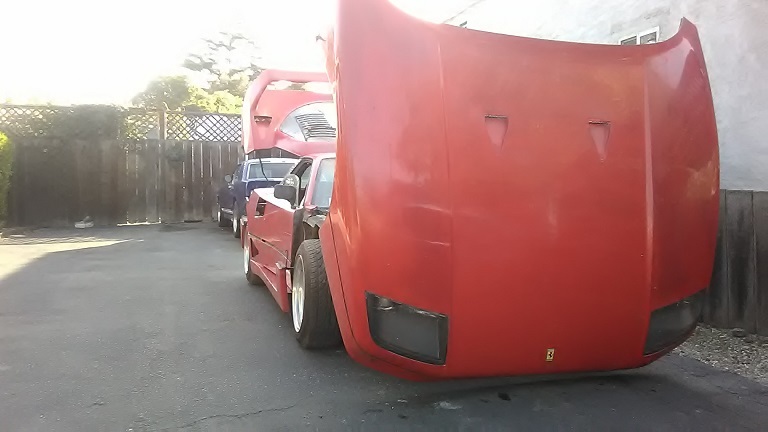 That is a lot of effort to turn around and sell it though. Doesn't look all that bad. I always thought the nose was the least real looking on most of those. I'll try to stay tuned for "Operation Turd Flush"
You've obviously got a much larger bar of turd polish than I do. ...and a lot more patience than I do. Yeah the hood just kills it for me lol. That and the front wheels being almost 3" inside the front wheelwell. The rest of the cars pretty darn close( minus the scoops are too big, the fiero roofline is yuuge compared to the real one, wheels wrong size, interior wasnt done, etc etc). Def not going to be making molds its fiberglass, cut and paste. 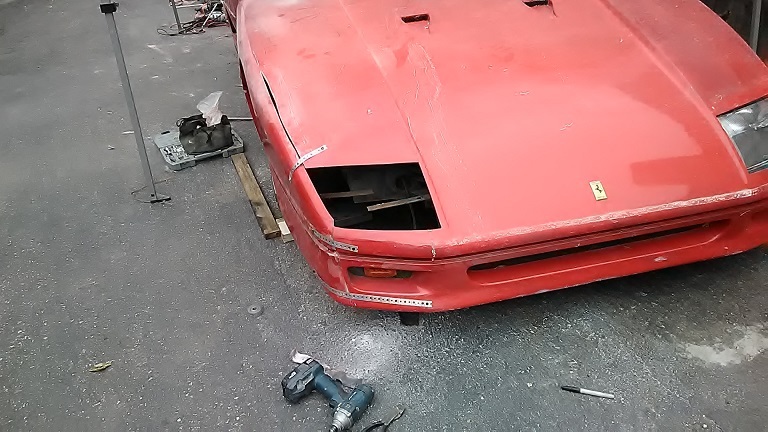 The trick is getting the lines right so its a 1/99th scale f40 lol. Wheelbase is 3" short. When works dead its dead and I have tons of free time. Just got a buncha work so I wont be able to do anything for a few weeks. Its running reliably now so Ill try to venture to the wheels shop to get the right spaced wheels n tires for it. Yeah im an old fart but def not patient! Tried that buddy, still looks bad lol. Certain angles the car looks terrible, others it looks ok(better now that ive done so much to it already) W some new wheels and a hood that looks very close to the real deal the car will look good. (and a paint job) Already got all the body lines to match up, door edge to rear panels were 1/2" off. 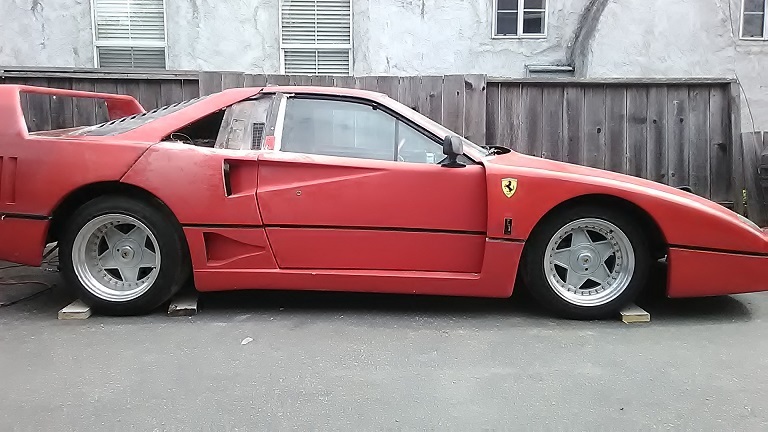 Having trouble finding wheels to fit. I may have to get some wheels w a diff lug pattern and get adapters for them to find something. ive got 16x10 in the front w 205/55 and 16x12 out back w 245/45. 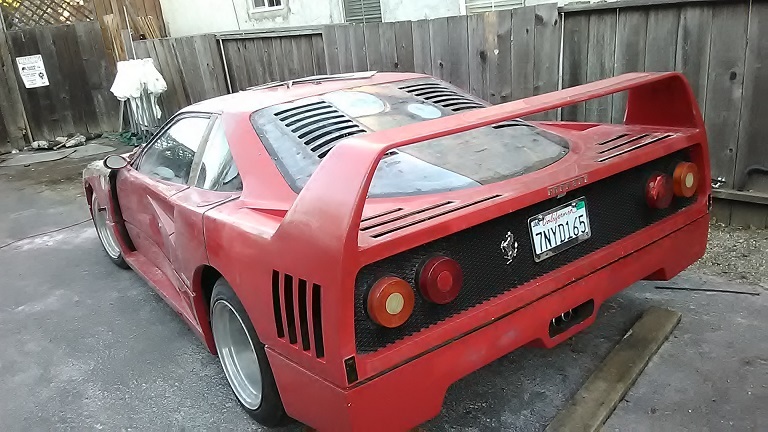 Not my favourite style of Ferrari to make a replica of. However, if you've got it running smoothly, then you should be able to make some body improvements with less effort than building from scratch. Just don't try to do it all at once. Fix it a little at a time. I'm looking forward to watching this car evolve over time. 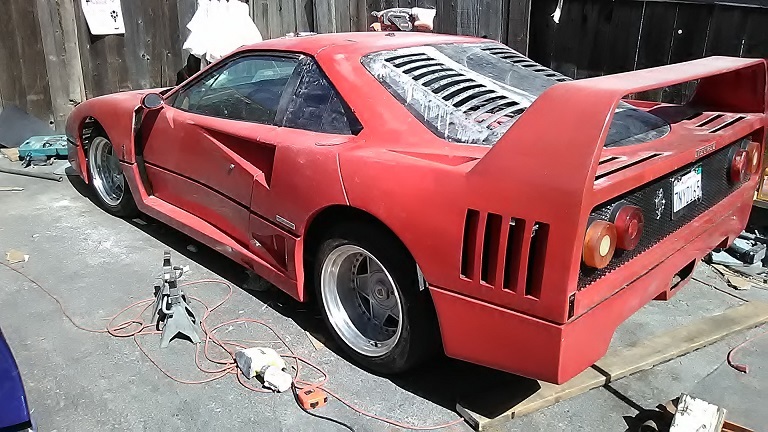 You know, there used to be a shop in Redlands California that did a bunch of these Fiero based kit car builds. 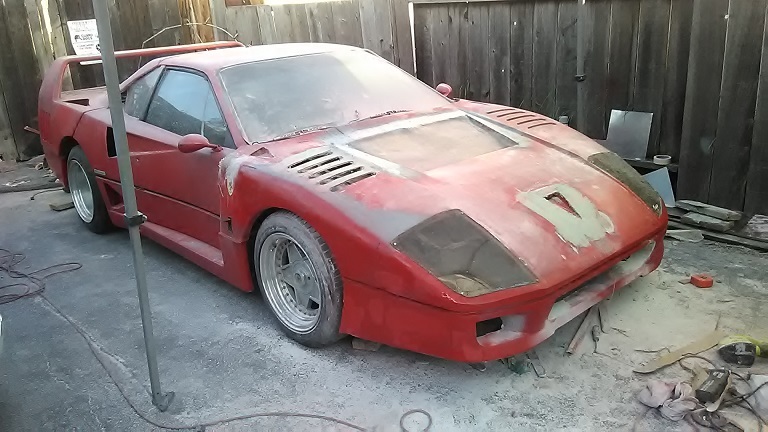 I used to drive by it and see partially built Ferrari and Lamborghini kits as well as pretty sharp looking completed kits. Every now and then I'd see them loading them up on a car carrier. 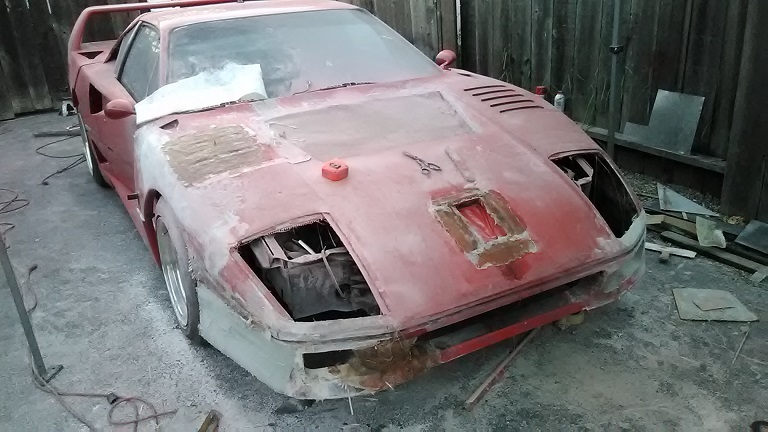 Makes me wonder how many of them are still out there and often when I see a kit restore/rebuild thread like this, if maybe that isn't one of the cars that came from that shop. 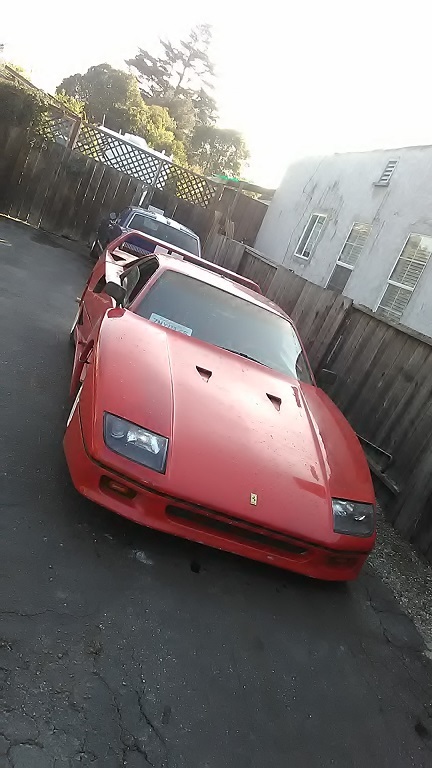 This has always been my fav ferrari. I tell people its a fierarri. say it with a new york gangster accent n its sounds right lol. yeah fuggetaboutit wiseguy! 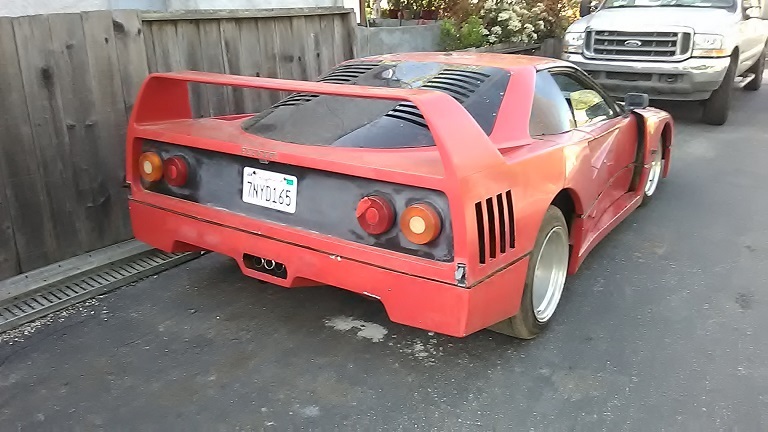 Yeah it was on the bay area craigslist. You dont happen to remember the name of that shop? 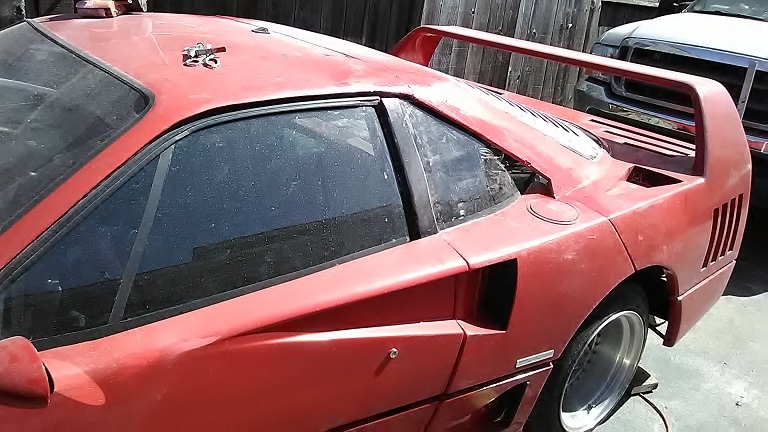 Might be able to find more info on this car. Ive heard there were only 2 or 3 places in Ca doing these. A guy on madmechanics said these kits were made by a company called xillion. I see these kits pretty often, looked like archie was doing them too. Same ugly lines and 300zx headlights. Ive seen some better looking kits but they seem more rare, mine seems pretty common. You dont happen to remember the name of that shop? 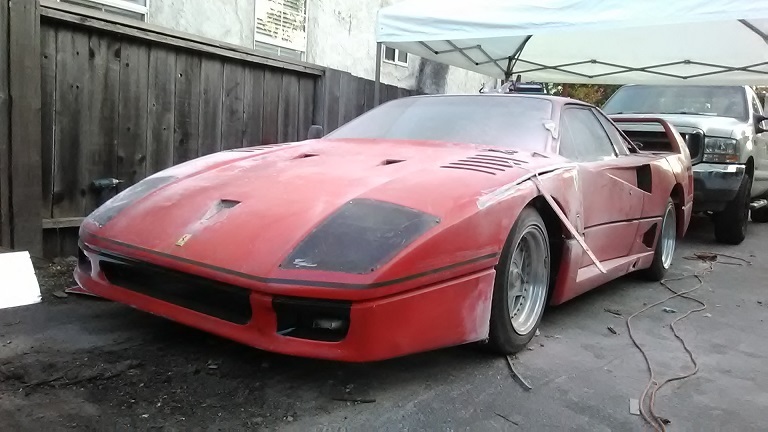 Might be able to find more info on this car. Ive heard there were only 2 or 3 places in Ca doing these. Unfortunately, I don't . That was back in the early to mid 90's. I've searched the web trying to discover it a few times, but while I found the building it was in on google street view, I couldn't find what the name of it was. Larry- I got it from a kid in san jose. He said he only had it for 8-9 months so he mighta bought it from the guy in clearlake. I can barely read " dave james bonds" and "your special agent" that someone tried to buff outta the sides and back. Theres a 1 800 number (lmao) barely visible if you get close enough and there were some stickers on the back that said ddi realty or something like that. I did a search on those n nothing came up. Khw- thanks for the replies and checking I appreciate it! Trying to find some past info on the car. 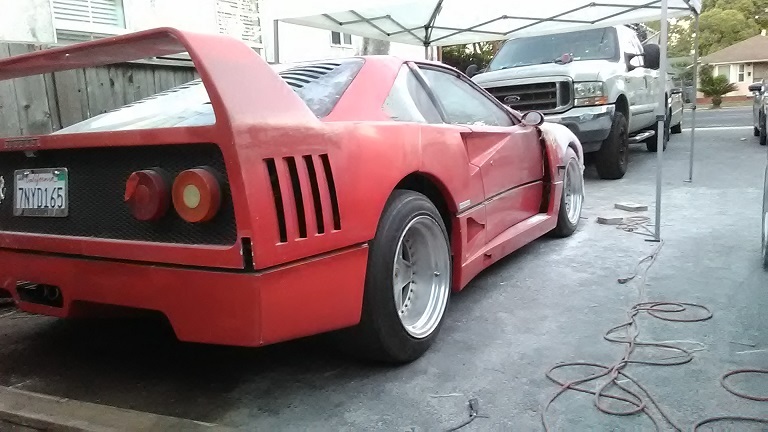 Yeah its ugly but somebody put a small fortune in money and time to make this turd back in the early 90's(im guessing). The fact its still around and running is a testament to the skills. 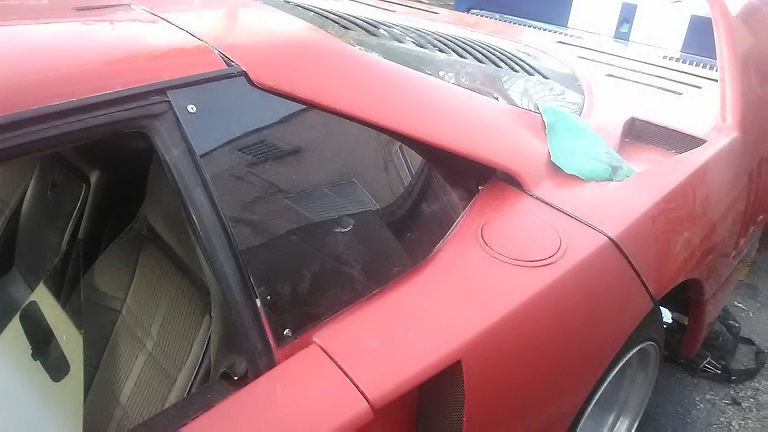 Got the quarter vents extended and the scoops look much better but im still not happy w the window line. Ill keep cracking at it lol. Man look at the front wheel gap, that just pisses me off. Having trubble finding wheels. Im now looking for wheels w the deep dish and ill but whatever wheel adapters I need to make the wheels fit. One shop quoted me 4-5k for custom made wheels, I told the guy I didnt pay that much for the car and he laughed. What diameter wheel are you going? 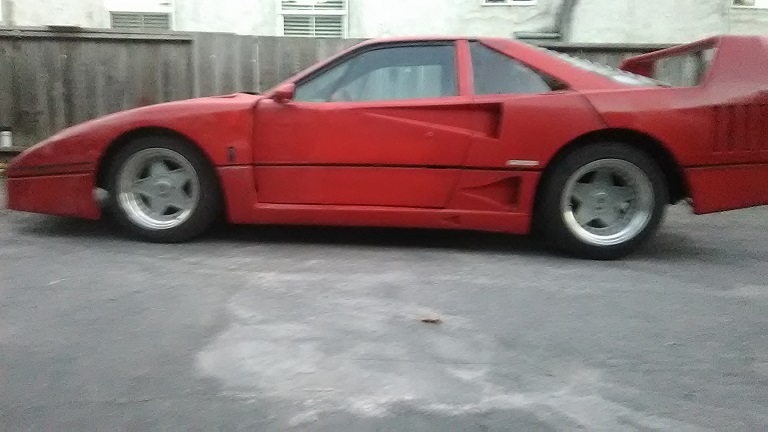 Looking for one that looks F40 style? Good luck! 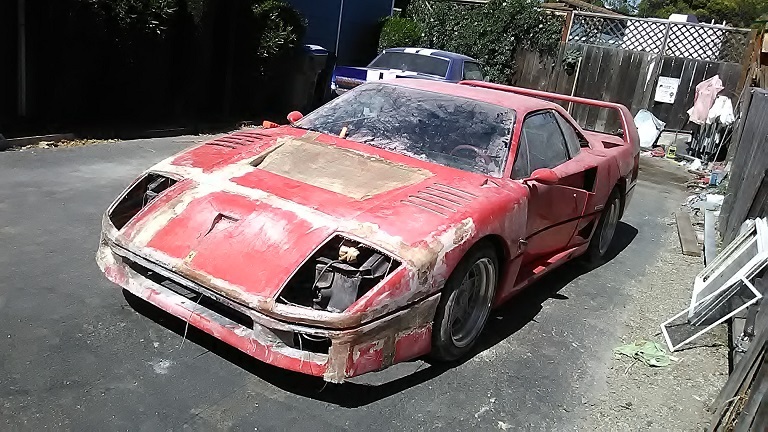 I bought my Fiero in much worse shape, you're is already looking better. 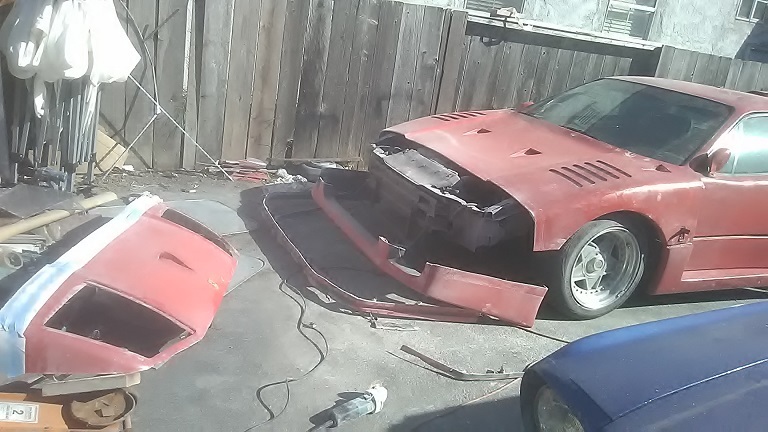 Took a short nap after work and didnt feel like doing anything on the car but ive been bitchin about the hood forever so I cut it into pieces. Make sure not to breath in that dust. This isn't your first rodeo with these cars is it? 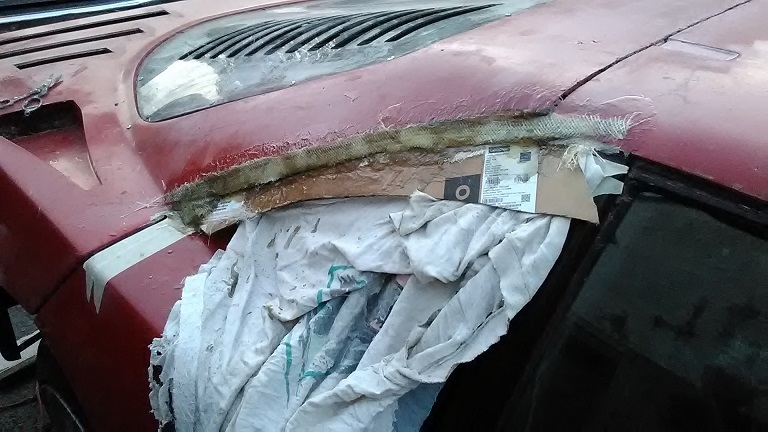 Got a few spare body panels in the basement? I must admit if I was your neighbor, I'd have called 911 by now. 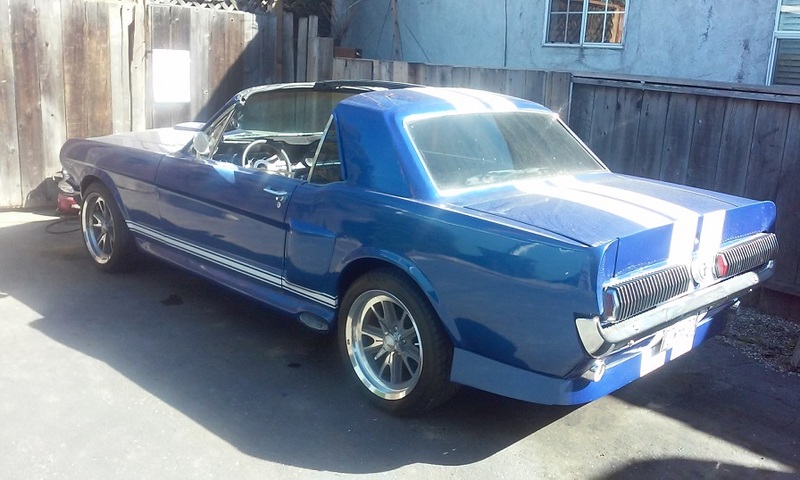 Is that a California Edition Mustang or a Cougar in the background? 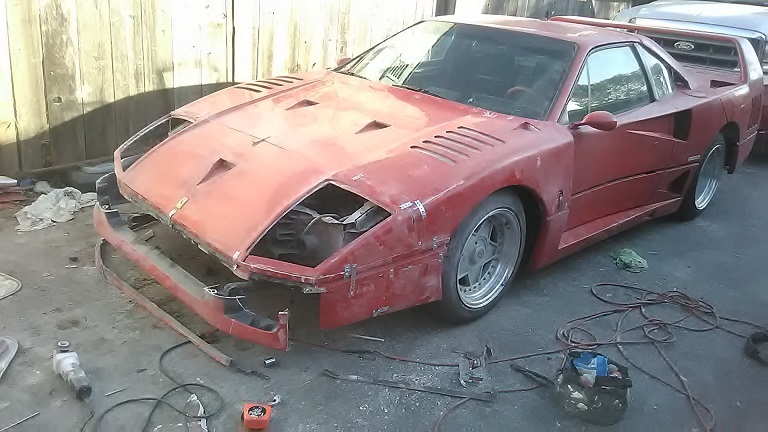 My first kit car yeah, im always working on stuff. Just usually not making so much dust. The neighbors love me, I fix their stuff. Just did the next door neighbors kitchen few months ago. One of these cars gotta go, im outta room. Might go back to flippin bikes n jetskiis. Anybody looking for a 69 bultaco? Hey, Shemmdog--do you know about our Golden Gate Fieros club? May mtg. was just last Tuesday, but next one will be the third Tues. of June, June 20, at the Hobee's, 800 W. Ahwanee Ave., Sunnyvale, at 6:30 in the back room. We'd love to meet you as some of us follow your project and see how you're doing! Hi, does Golden Gate Fieros have a facebook presence? Are you planning on keeping or selling this when you are done? Sorry we don't, 2.5. 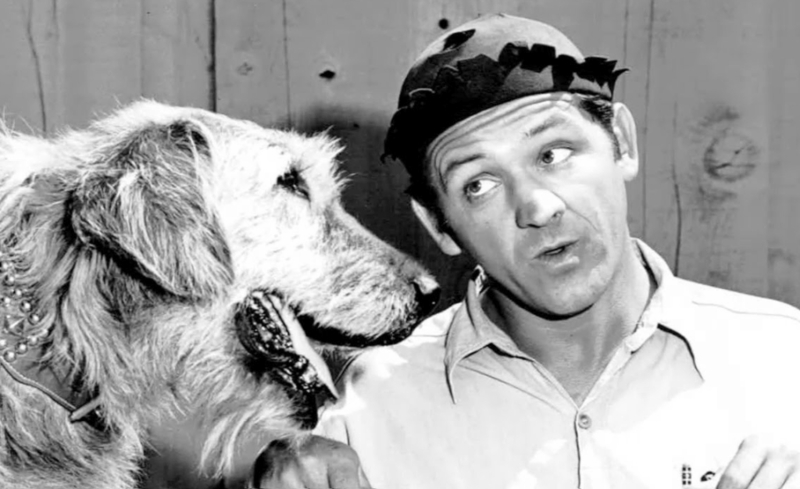 We're still trying to get someone to get our website back up or establish a new one. We're just active on Yahoo! groups still in addition to our monthly meetings and occasional events. I think you have the Yahoo! link already in your club contact thread. Thanks for checking. If we get something else going I'll be sure to add it. Had some jobs in the hoighty toighty part of town. 2 packs o smokes n a gatorade $30.99. 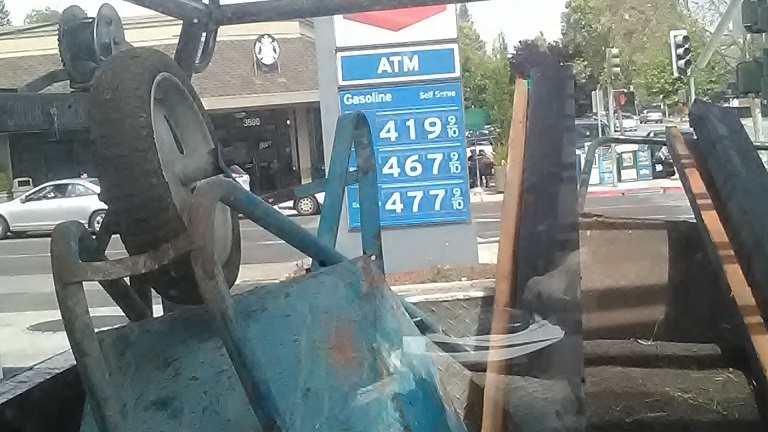 Look at the gas prices. Seriously thats a dollar more than here in the Midwest ( at least where I am) for gas.